Make sure that the information on your credit report is accurate. Are there accounts that don’t belong to you? Do balances appear even when an account has been paid in full? Pay your bills on time — every time. Send credit-card payments several days in advance of the billing cycle cutoff date instead of the due date listed on your statement. Keep your outstanding balances at 30 percent or less of your total credit line per account. This approach is just one of the many ways that help raise your credit score. Avoid opening new accounts. Transferring existing balances to a new lower rate card lowers your interest expense (often only temporarily), but it also lowers your credit score. Keep the old accounts open, even if you don’t use them. But watch out that no one else is using them, either. The length of time you have maintained your accounts is key. Not only is it important for you to monitor your credit report, you need to monitor your credit score. You can use the Credit Score Monitoring Worksheet to keep track of your credit score over time. 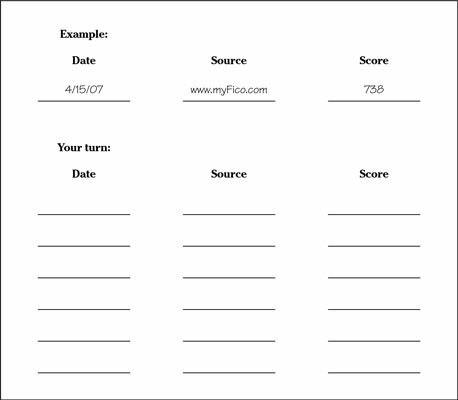 Click here to download and print the Credit Score Monitoring Worksheet. The Credit Score Monitoring Graph lets you track your credit score over time. Remember, the higher the number, the better! 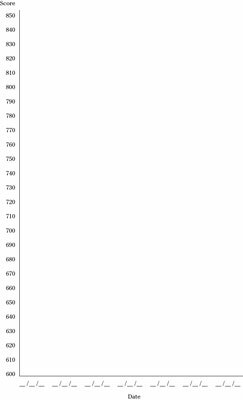 Click here to download and print the Credit Score Monitoring Graph.